WW1 souvenir of Egypt, framed embroidery, WW1 3rd Auckland Mounted Rifles. green silk with pink fringe around the edge. in centre is a stitched bird (hawk) in red and grey colours with the names "Te Kaahu Mataare" ( Be like a hawk) stitched across the bird's tail. underneath it has the words "Egypt 1915" in red stitching. 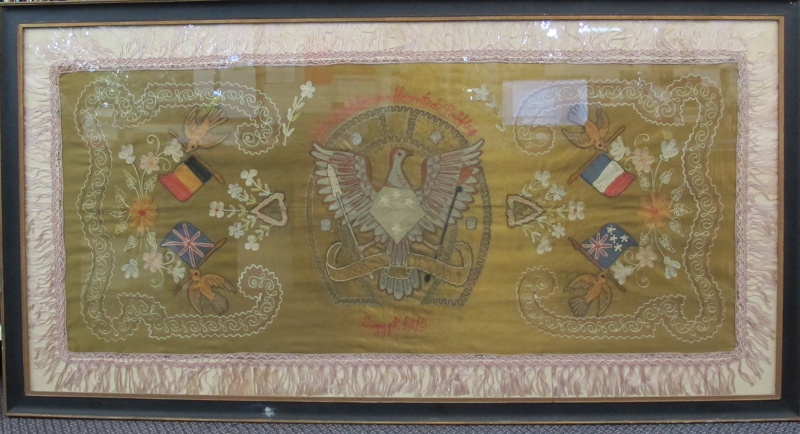 It has big stitched scroll on each side with 2 doves carrying flags of Germany, Britain, France, and NZ/Australia. across the top is "3rd Auckland Mounted Rifles" in red stitching. it has a wooden frame and glass front. 71cm high, 136cm wide and 2cm deep.